Allryder provides comparable route planning information for urban travel. It enables you to compare the time and cost of any given journey across multiple transport mediums, in order to find the most-suitable routes for users needs. Users get real-time information and are navigated for the entire duration of the journey. 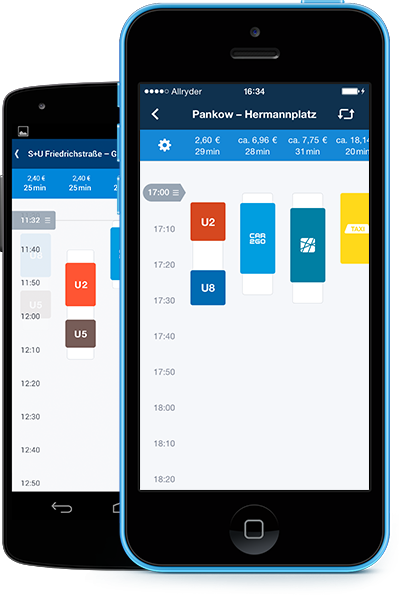 Moreover, Allryder provides information on trains, trams, buses, taxis and car-sharing services such as Car2Go and DriveNow. This provides comprehensive coverage in one simple, easy-to-use app. Allryder has already proven successful with wins at the Mobile Tech Conference 2014 in Munich for the best travel and mobility app and is successfully growing and developing an extensive and dedicated userbase.